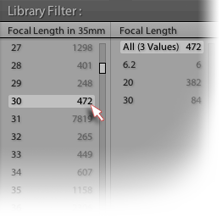 I've just released a new plugin, Focal-length Sort, conceptually similar to my Megapixel-sort plugin in that it fills gaps in Lightroom's Library Grid Filter that shouldn't be there in the first place. Like my Data Plot plugin, it can give you insight about how you use your lenses. This makes 19 plugins for Adobe Lightroom that I've released, all available on my Lightroom Goodies page. Why doesn’t the plugin focal length sort show any actual focal lengths, only Alle (German for all), or Kein Wert (not set)?